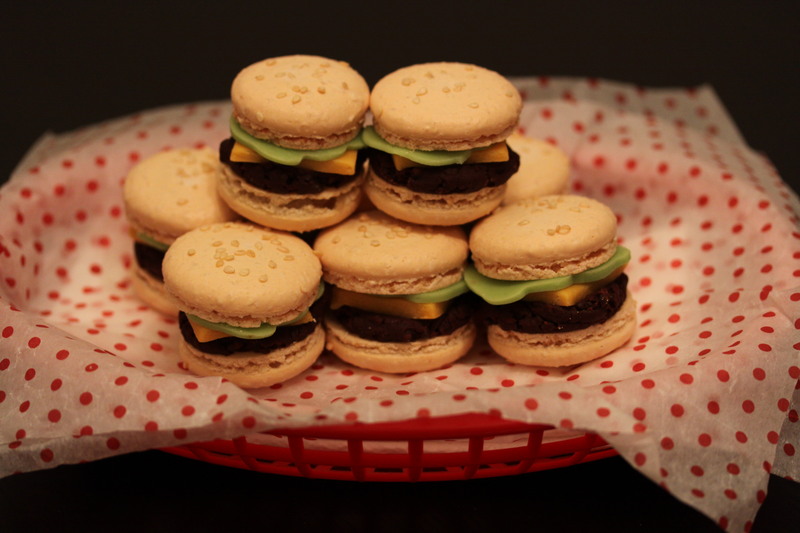 As a special April fool’s day dessert I made cute macaron “sliders”. Macaron shells sprinkled with sesame seeds, filled with thick chocolate ganache mixed with chocolate sprinkles for texture, and cheese/lettuce made from marzipan (which I promptly removed before eating because I highly dislike the taste of marzipan). Don’t be fooled by the apparent complexity of macaron recipes. Just think of it as steps to follow. 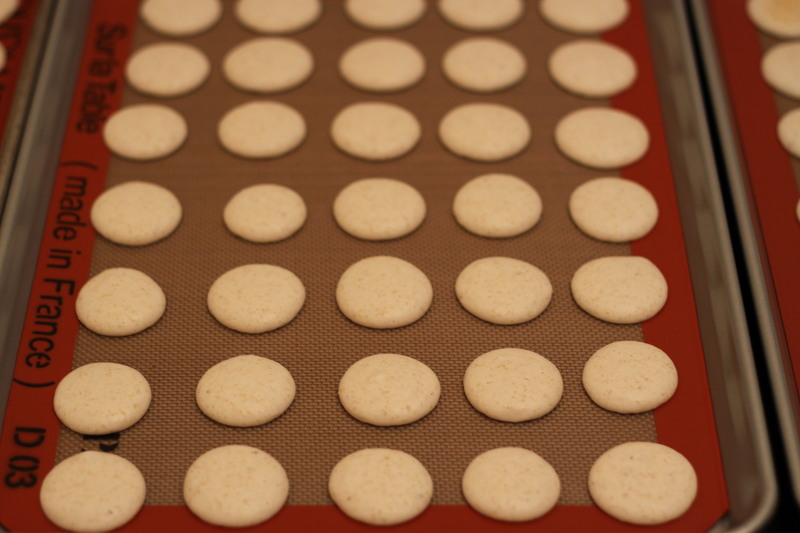 I’m including a few behind the scenes pictures depicting the process of making macarons. If you’ve never made them, this will give you a good idea of the steps. Note: Separate the egg whites 24 hours in advance. If you can avoid it, do not use fresh eggs, I like to use eggs that are at least a week old. Let the egg whites sit uncovered at room temperature for a couple of hours before you start the recipe. 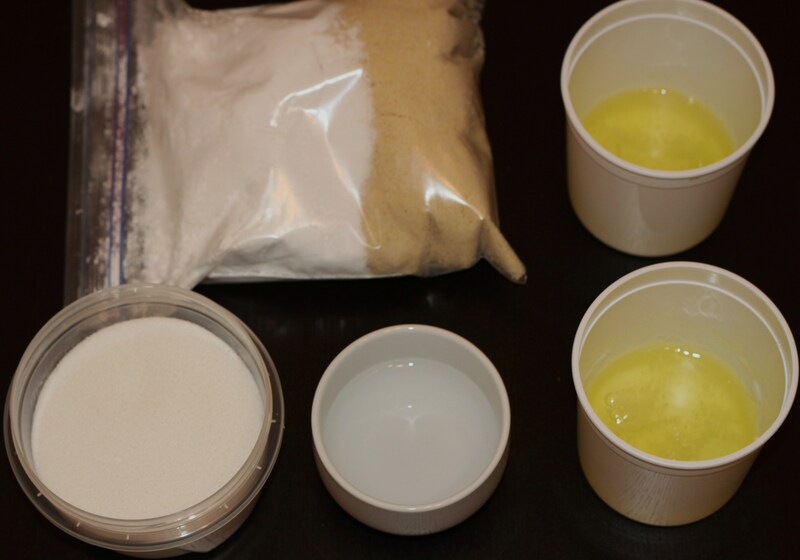 1.Measure out all your ingredients and have everything ready before starting recipe. Pass the almond meal and powdered sugar through a mesh strainer. This is not necessary, and I skip this step many times. You will just get a slightly more grainy look on your shells, texture and taste is not affected. 2.Add first 110g of egg whites into the almond/sugar mixture without mixing them. 3. Boil water and granulated sugar to 118°C (244°F). When the water and sugar reaches 110°C (230°F) start whipping the 2nd 110g of egg whites in the mixer using the whisk attachment. You should have a somewhat stiff meringue before adding the sugar. This is important, otherwise the egg whites will liquefy and you will have to start over. 4. Pour the 118°C (244°F) sugar on the inside side of bowl while mixing the egg whites so that it does not splatter. 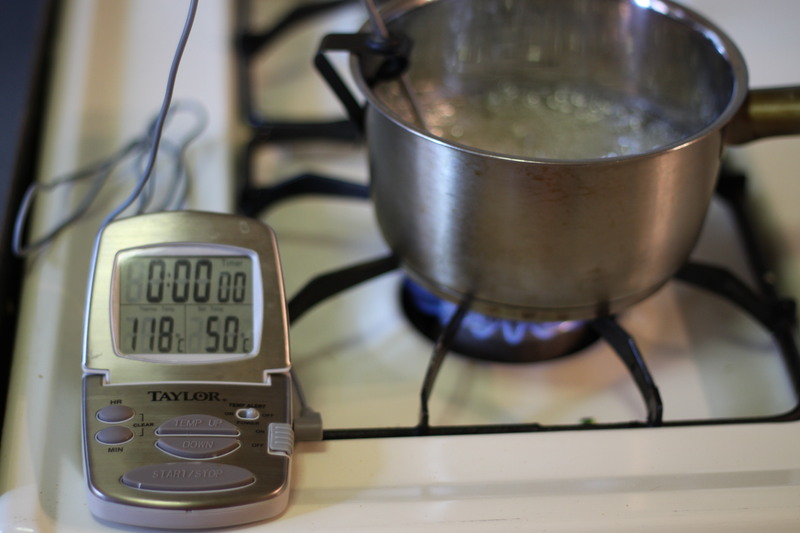 5.Continue mixing until the mixture cools down to 50°C (122°F). 6. Fold almond meal/confectioner’s sugar/egg whites into meringue with a large spatula. Continue to fold until you reach the proper consistency. Some people describe it as having the consistency of “magma.” I’ve never seen “magma” so I do not know what they mean by that. The mixture will be somewhat heavy, but it should flow. You have perfect consistency if when you pipe the macarons the little peak that is made after you pipe them completely disappears. 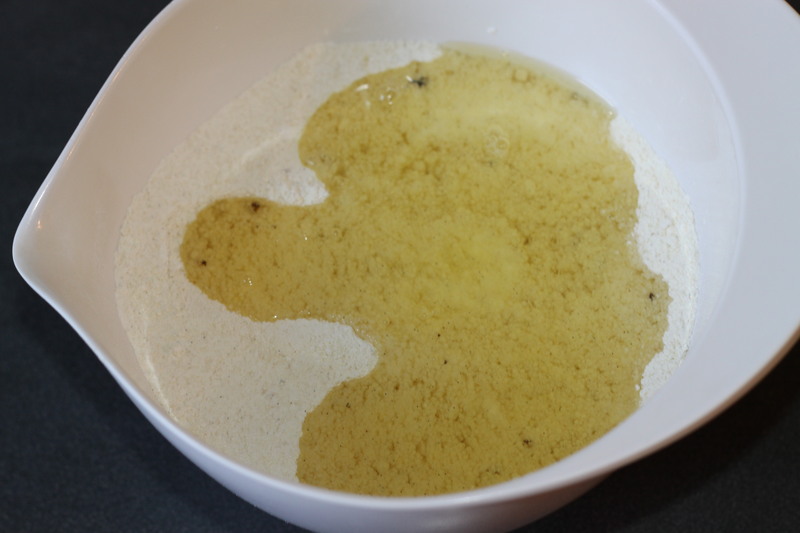 If the little peak stays there, then you have under-mixed your batter, which is ok, this is better than over mixing it. Just wet the tip of your finger and gently push the tip down. If there is no little peak right after you pipe them and they spread out on the cookie sheet, then you have completely deflated your meringue. 7. Pipe on Silpat lined cookie sheets. Firmly rap the cookie sheets against the counter a few times. Let the piped shells stand uncovered for 30 minutes. When you touch the shells they should not stick to your finger. It may take longer on very humid days. But don’t let them sit more than they need to because then they may crack when they bake. I typically don’t let them sit more than 45 minutes. 8. Pre-heat oven to 180°C (356°F) and bake for 12 minutes. Since 356°F is hard to calibrate on US made ovens, I opt for 350°F instead. Ovens vary, and you may have to adjust your baking time. 9. Let macarons cool for about 10 minutes. Remove from cookie sheets. They should easily peel off the silpat. Otherwise, remove them with a small offset spatula. Let them cool completely. Pipe the ganache on the inside of one shell, and place another shell on top. 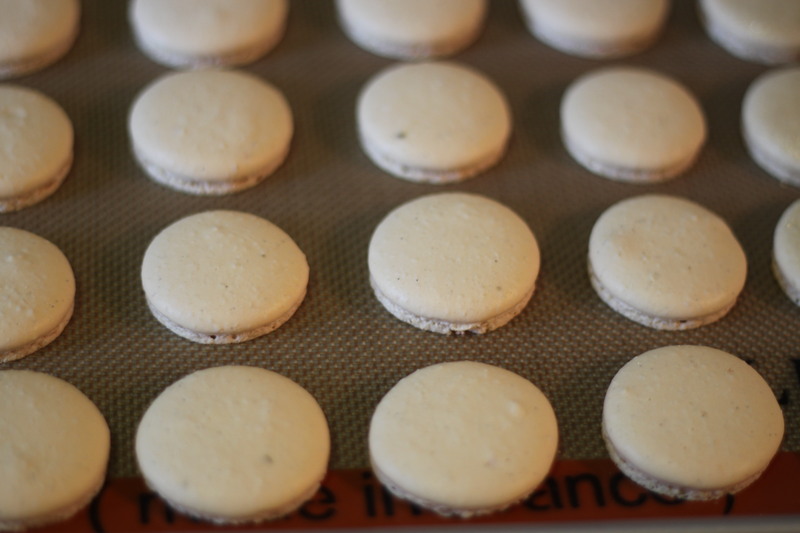 Refrigerate macarons in an airtight container for 24 hours before serving. 1. Place cream and vanilla seeds and pods in pot. Bring to a simmer. Turn off and let infuse for 30m. 2. Melt chocolate over a water bath. 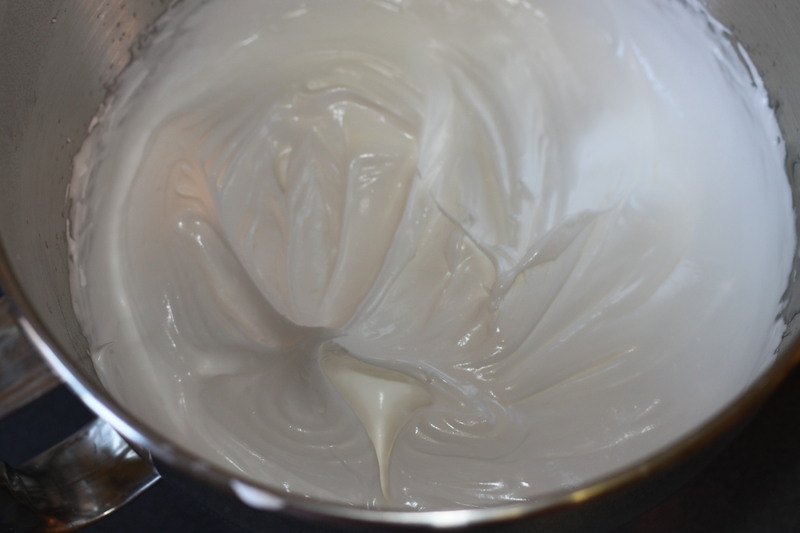 Remove vanilla beans from cream. 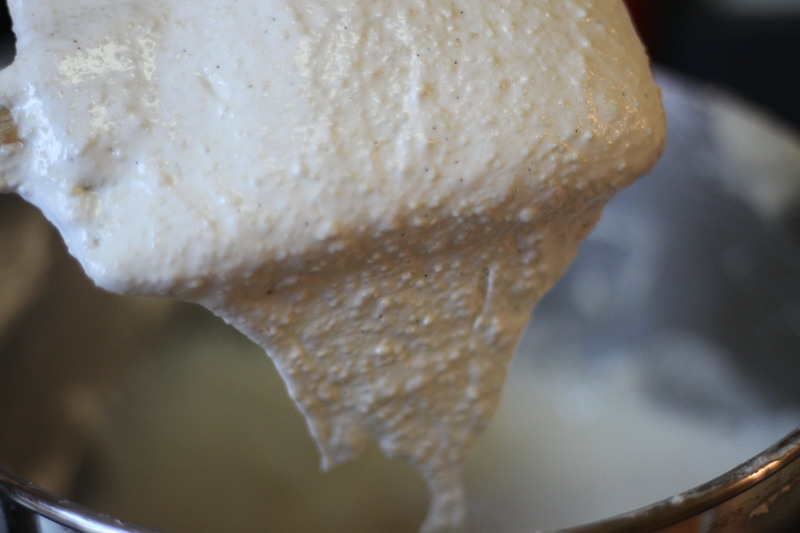 Pass cream through a fine mesh strainer. Incorporate the cream into the chocolate in 3 additions. 3. Pour ganache in a shallow gratin dish or plastic container. Refrigerate until thickened, about 1 hour. 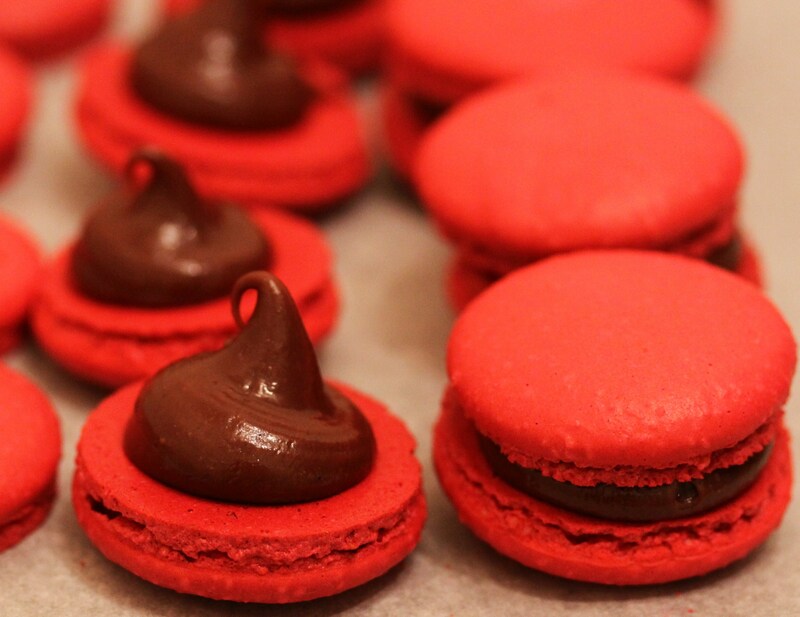 Note: this recipe makes a lot of filling which I don’t mind since I like to overfill my macarons. Also, this is a very thick chocolate filling. If you want to refrigerate it overnight you may want to make a thinner version by adding more heavy cream, otherwise it will be too hard to pipe. Recommended Equipment: having all the items below is not necessary to make macarons, but it sure makes the process of making them much easier. •	Read recipe, start to finish before purchasing ingredients, and again before making it. 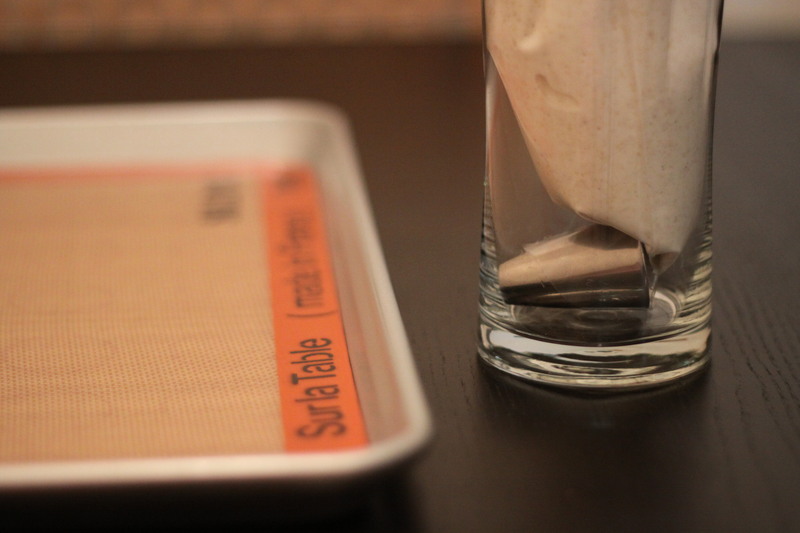 •	Have all your ingredients measured, and ready. •	Remove eggs from the refrigerator right before separating the whites from the yolks. It is easier to separate cold eggs than it is to separate room temperature eggs. •	Let the piped shells sit at room temperature for 30 minutes before baking to let them harden. When you touch the shell, it should not stick to your finger. •	If you decide to make less than the full recipe, do not use a kitchen aid mixer or any other large stand mixer. 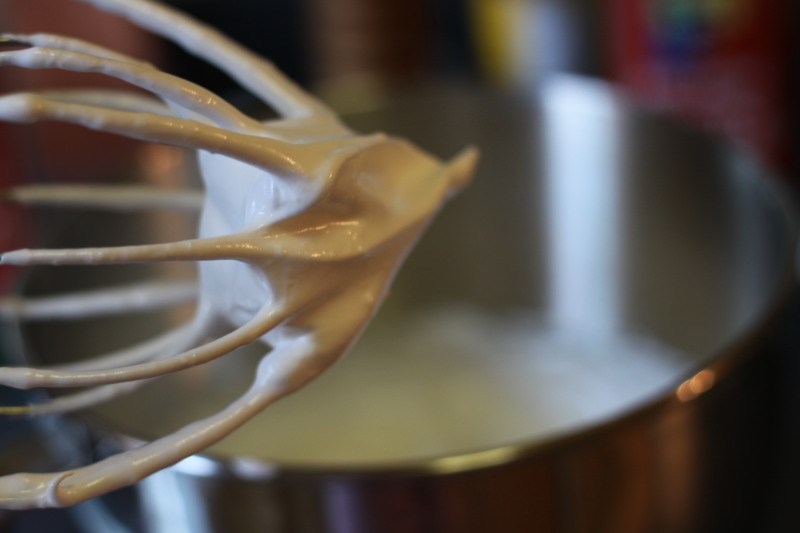 Instead, use a small handheld mixer because the amount of egg whites will not be enough to ensure correct contact with the whisk attachment. Be careful when adding the hot sugar mixture into the egg whites. •	Cracked shells? If your macarons break on the top of the shell that means that your oven was too hot when you put them in. Try baking your next batch at a lower temperature. This can be caused by “hot spots” in your oven. Also, this could be due to too much humidity in the batter. You can usually avoid cracked shells by letting them sit for 30 minutes before baking. •	No feet? Your mixture is too dry, or your meringue is too stiff. •	Macarons spread too much when piped? This will probably also lead to no feet. The egg whites were not beaten properly before adding the sugar or you over-beat the batter when folding in the almond meal mixture. •	Total Macaron Fail? A great site that answers most, if not all, failed macaron questions: http://kitchenmusings.com/ Just search for macarons and read all the posts. A lot of helpful information! •	More macaron resources at the bottom of my Macaron Day post. If you have any questions feel free to leave a comment. I could write about macarons all day, and I’m happy to share all my “fail” stories with you (and believe me there are many). I like sliders. They taste good. Great job!! 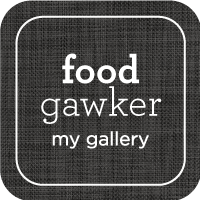 I JUST saw these on Foodgawker… beautiful!! Yum! This one look so cute and tasty, im sure my daughter will love it. I just save your recipes btw, and i’ll try it this weekend. This is such a cute idea. Very well executed, too! I discovered your blog, and i loved it !!! 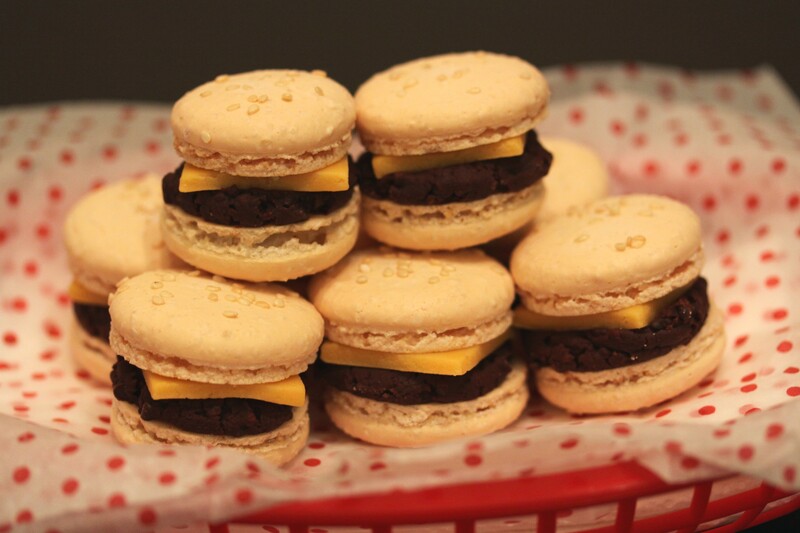 Kaitlin–yes, I’ve also had several friends tell me that macarons look like mini burgers! That is where the idea originally came from. Beautiful, vibrant colors. Such a great April Fool’s and Easter treat! OH, these are just awesome! What a great idea – wish I had thought of it! WOW – you have mad skills girl. These look AWESOME!!! How can I convert grams into cups (US version)?? 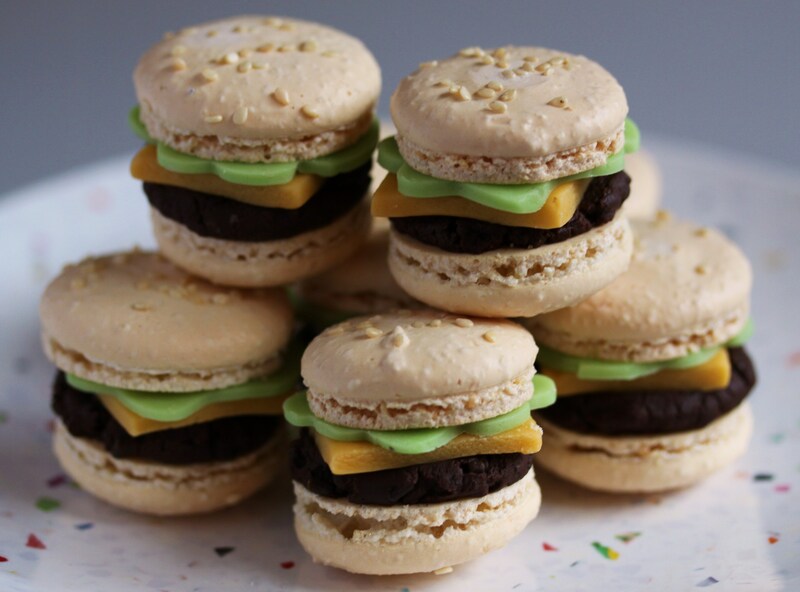 These burger macs are SO CUTE i can hardly contain myself! Perfect little things!! Thanks for the awesome recipe. I’ve tried a few, but this one has yielded the best results. The only thing I need to work on now is how much turn is needed for the batter. My first batch was so under-turned, the shells had the shape of meringue cookies. I cannot get those strong colors. Please tell me how to do it. Your macarons look great! Just wanted to know how many macarons does this recipe yield? thanks! 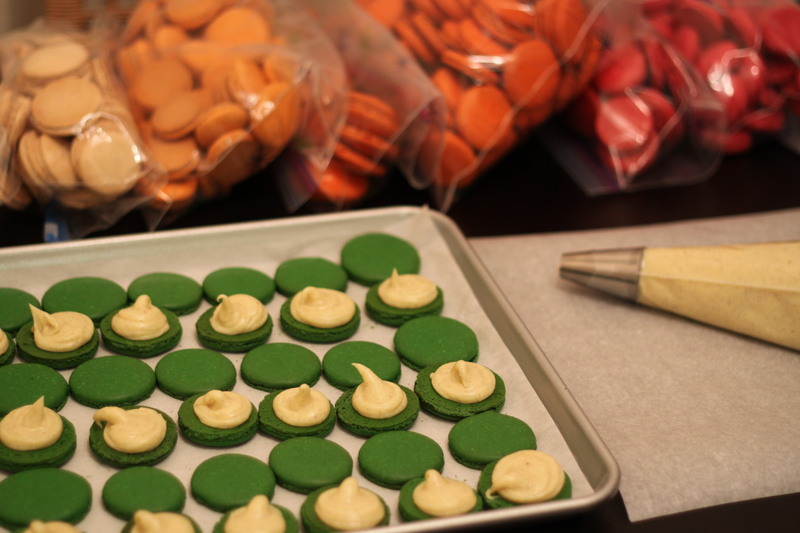 Ivy–The recipe makes about 70 macarons. why print all the comments!!!!!!! Judging from the picture of ziplock bags full of macaron shells, I’m assuming we can make the shells ahead of them and not fill them? If so, how long can they be stored? And will they taste the same as fresh ones when I do fill them? I’m having difficulty converting metric to (the very backward) American units of measurement. Help?